If you like your sandwich with a side of ambiance, this is the place for you. Clusters of bare bulbs hang artfully from the ceiling, and colorful illustrations of a helmet-clad scooter girl adorn the walls. 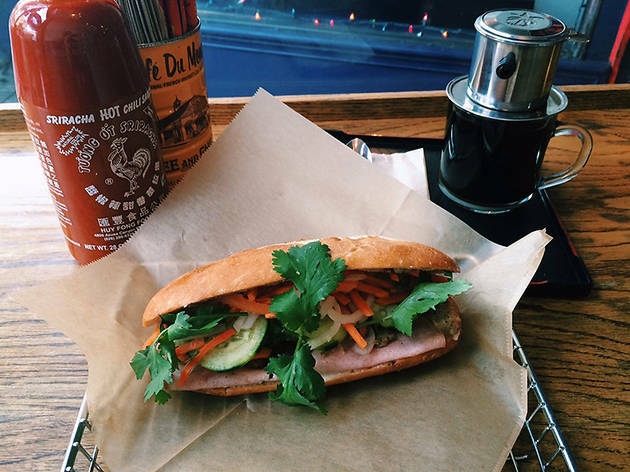 (If, on the other hand, you're constitutionally opposed to paying more than $5 for banh mi, keep walking.) There are nine versions of the sandwich available, including modern twists like turmeric-spiced fried catfish and red curry ground beef with thai basil. 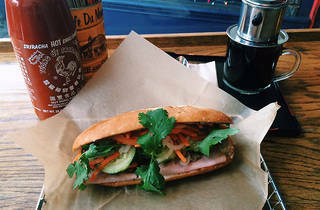 But the real star is the kurobuta pork, best showcased in the Bun Mee combo: grilled lemongrass pork, paté de campagne, mortadella, garlic mayo shaved onion, pickled carrot and daikon, cucumber, jalapeños and cilantro. Apart from sandwiches, the restaurant serves up dinner-sized salads, noodle and rice bowls and crowd-pleasing sides like Momma Tran’s crispy egg rolls and salt and pepper fries sautéed with red onions, garlic and jalapeños. Tried the combo sandwich and the belly bun...I have to say I wasn't impressed by either of them. The bread just wasn't that soft, crunchy on the outside roll that you salivate for when you walk into an authentic place. The filling just wasn't tasty and what I'd expect from a great banh mi. It just seemed all to commercialized and not sticking to the Vietnamese roots. The price tag is also hefty considering you could get amazing sandwiches for half the price elsewhere. Were the sandwiches decent? Of course! I think I'm just more accustomed to the real deal. 3 stars.